A number of parishes throughout the Archdiocese of Philadelphia will conduct a Holy Hour to pray for vocations to the priesthood this Sunday, Jan. 6. In November archdiocesan parishes participating in the Called by Name program asked parishioners to nominate men they thought would make good priests, and encourage them to consider discerning a call to the priesthood. Those men have been invited to attend the Holy Hours, along with interested parishioners. It is perhaps no coincidence that Jan. 6 happens to be the Feast of the Epiphany, which according to the Gospel of St. Matthew, commemorates the visit of the magi from the East to Bethlehem, the place where Jesus was born. It was the first revelation to the world at large that Jesus, who would be the Savior of the world, was born. But epiphany has several meanings, including the sudden realization of fact, including the fact that God calls men to enter the priesthood. It’s not necessarily a light bulb moment and probably in most cases probably a slow process resulting in an eventual epiphany. Clearly, because of the highly publicized child sexual abuse scandals that have rocked the church, the number of prospective candidates for the priesthood has declined, but men are still coming. At this point the Called by Name Program has identified about 75 men who have been suggested by fellow parishioners as good candidates for the seminary and invited to attend the Holy Hours, according to Father DeLacy. The planned Holy Hours “are meant for men who have responded to the call and also an opportunity for the people of God to pray for vocations,” he said. Some parishes within the archdiocese have done especially well in fostering religious vocations. Just to name a few, Father DeLacy mentioned St. Bede, Holland; St. Agnes, West Chester; St. Agnes, Sellersville; Sacred Heart, Royersford and St. Andrew, Newtown. “We’ve been blessed, we have two guys in the seminary at St. Charles,” said Father Jeffrey Stecz, pastor of St. Agnes in Sellersville. “Another parishioner has made his final vows as a brother with the Franciscans and a girl is in final formation with the Capuchin Sisters of Nazareth in Scranton. The parish makes a point to pray for vocations at the daily Masses, according to Father Stecz, who believes the men who are entering are not discouraged by the scandals but want to be part of the solution. Father Stecz recalls his own faith journey. Although he did not share it right away, as a teen he wanted to be a priest, and this was really fostered in college through the Newman Club. He finds a surprising number of kids today who are entering religious life were home-schooled. Also, St. Agnes has strong youth groups and some vocations have come from teens who have attended youth programs at Franciscan University in Steubenville, Ohio. “We also have an adoration chapel and some young people stop in there,” he said. St. Andrew in Newtown is a huge parish, so some religious vocations might be expected, however, encouragement goes a long way. “Every so often we preach about vocations, share our own stories,” said Msgr. Michael Picard, St. Andrew’s pastor, “and we invite priests at surrounding parishes to come in to preach. Some of our guys go to the local Catholic high schools to preach. The proof is in the results. 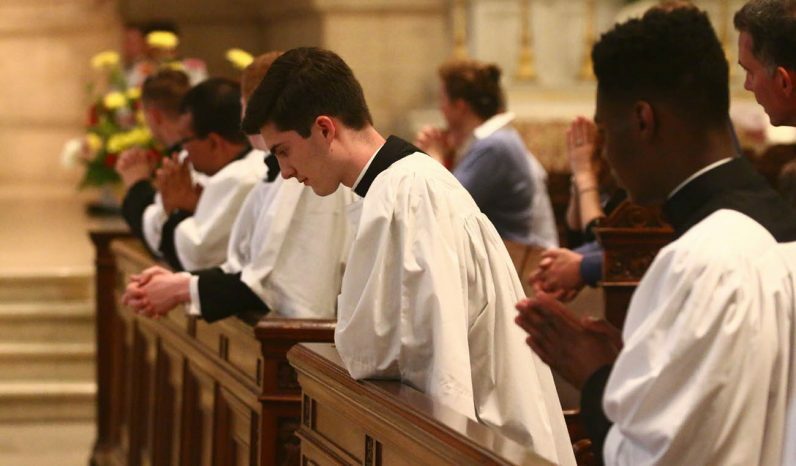 At this time two young parishioners, Andrew Auletta and Henry Graebe, are both in the Theology Division at St. Charles Borromeo Seminary; Father Patrick Muka was just ordained for Philadelphia and Father Gregory Pine was ordained for the Dominicans. Luke Barrajo, a member of Our Lady of Guadalupe in Doylestown and now a sophomore in the College Division at St. Charles, did not have a straight path to the seminary. When he was young, his mother was a practicing Catholic who saw to it that he attended PREP and Mass. But his father was not, at least until he was persuaded by a friend to accompany Luke on a pilgrimage to Lourdes. Then he too began practicing his faith. From an early age Luke wanted to be a priest, but by the time he got to Central Bucks East High School and sports, a vocation wasn’t cool and he put it out of his mind. But he was an altar server, and other people thought the priesthood was where he belonged. “Just think about it,” she urged. After ultimately agreeing to go to an information dinner, his old desire for the priesthood came flooding back. Yes, his mother urged him but he credits his guardian angel and the Blessed Virgin for his final choice. She was the patron of all three parishes of his youth: Our Lady of Mount Carmel, the Shrine of Our Lady of Czestochowa and Our Lady of Guadalupe. SS. Peter and Paul, West Chester, 7-8 p.m.
St. Raymond of Penafort Parish, Philadelphia, 9 a.m.
Our Lady of Charity, Brookhaven, 11:30 a.m.-12:30 p.m.
St. Anthony of Padua, Ambler, 12:30-1:30 p.m.
St. Denis, Havertown, 1-2 p.m.
St. Elizabeth, Upper Uwchlan, 2-3 p.m.
St. Margaret, Narberth 2-3 p.m.
St. Mark, Bristol, 3-4 p.m.
St. Martin of Tours, Philadelphia, 2-3 p.m.
Cathedral Basilica of SS. Peter and Paul, Philadelphia, 5:30-6:30 p.m.
St. Eleanor, Collegeville, 6-7 p.m.
Our Lady of Guadalupe, Buckingham, 7-8 p.m. While I think it is always a worthwhile idea to pray for priestly vocations, does the archdiocese give equal attention to promoting vocations to consecrated life for women and men?